Sprint, TrueCar, and SodaStream have trounced the market in the past year. But which one has the best shot at extending its recent gains? The stock market has had a solid 12 months, with major indexes up 15% since last April. Yet many individual stocks have enjoyed rallies of many multiples of that figure. Head-turning gains suggest dramatic improvements in the underlying business that might pave the way for continued market-beating returns for investors. Alternatively, quick, sharp spikes could set the stage for a painful decline. With that in mind, let's take a closer look at the prospects for three stocks: Sprint (NYSE:S), TrueCar (NASDAQ:TRUE), and SodaStream (NASDAQ:SODA), which have risen at least 150% each in the past year. TrueCar has come a long way since CEO Chip Perry took over the top spot in late 2015. Back then, executives described their latest quarter as "a difficult one" that "marked the close of a challenging year." The online automotive retailing platform had just posted a net loss of $65 million, compared to $48 million in the prior year thanks to underwhelming sales and monetization metrics. Its 2016 fiscal year was far stronger. Net loss shrank to $42 million as its dealer count surged and revenue growth sped back up to a double-digit pace. Lifted by this happy reversal, the stock has jumped 170% in the last year. Perry and his executive team admit that the business isn't out of the woods yet. "We are nowhere close to declaring victory," he told investors in February, "but we exited 2017 with significant velocity." The key to the stock's future gains will be whether the company continues to march toward profitability even as sales growth stays strong. Investors will be watching for more improvements in the dealer network in 2017 as revenue rises to over $315 million from $277 million last year. Sprint shares are on fire following impressive operating results. The cellular giant recently logged its best quarterly customer additions figure in four years as it snatched market share from rivals Verizon (NYSE:VZ) and AT&T (NYSE:T). Both peers stepped up their promotions last quarter, which led to an uptick in Sprint's cancellation rate, yet the company still managed to bring in 405,000 new postpaid customers. Yet Sprint is far from profitable, having lost $923 million over the past nine months. That brutal result is entirely thanks to the company's $31 billion debt burden, though. Interest expenses amounted to $1.8 billion in the first three quarters of fiscal 2016, which was enough to wipe out the $1.3 billion of operating income it managed. S Operating Income (TTM) data by YCharts. 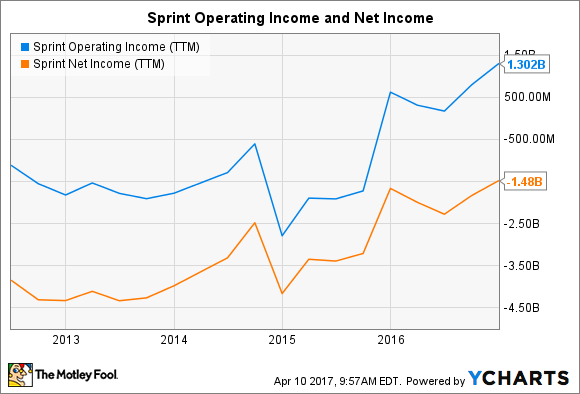 For the stock to keep climbing, investors will want to see Sprint's operating cash expanding at a fast-enough pace to reduce its burdensome debt load over the coming years. After two years of brutal sales declines, at-home beverage machine maker SodaStream is back to posting solid growth. Machine sales jumped 37% last quarter thanks to a healthy mix of improved volume and higher average prices. Carbon dioxide canister sales, which is a proxy for the number of active customers, rose 10% to cross 7 million. Those numbers all suggest SodaStream has achieved its pivot away from a soda focus toward a sparkling water branding. The key challenge ahead is to build on that success to increase its household penetration even as traditional soda companies all fight over the fast-growing sparkling water segment. Unlike Sprint, SodaStream's business isn't groaning under the weight of hefty debt payments. And in contrast to TrueCar, this business is already profitable, having recently posted an almost quadrupling of annual net income to over $44 million. Those impressive metrics, plus the potential for increasing profitability from high-margin, recurring carbon dioxide sales, tell me that SodaStream has the best chance out of this group to produce additional market-thumping stock gains in the years ahead.